Back in my “bachelor” days, my roommate and I would once in a blue moon make a grand dinner. 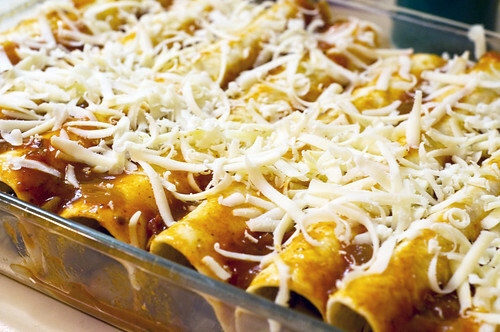 One of our favorite recipes to make was enchiladas. Filling and delicious and inexpensive to make they were comprised of essentially cheap meats, cheese, enchilada sauce, and tortillas. It was for those reasons that they immediately came to mind yesterday as I was pondering what to make for Neil after his marathon 13 hour day at work. Unlike the enchiladas we used to make, these are very low in fat and cholesterol and the veggies are a great source of vitamins and energy. You also feel just as full after eating two or three as you would eating the heartier meaty ones. 2. 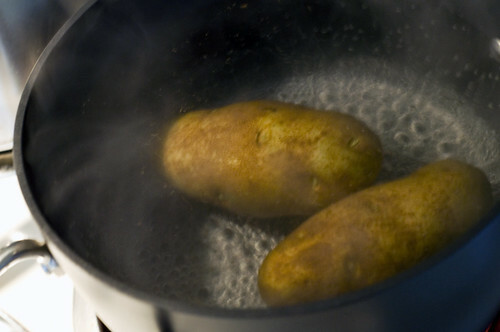 Boil or steam potatoes until almost done, but still firm. 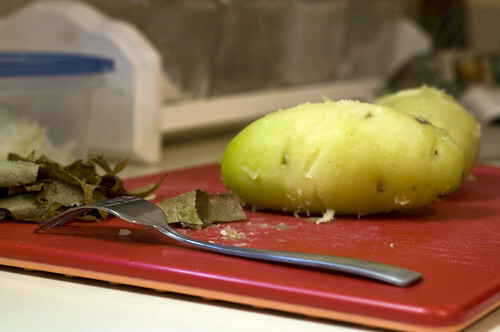 Peel the skin off with a knife while the potatoes are still warm. Dice the potatoes into small cubes and place in bowl. 3. Next, saute onions in olive oil until transparent. Add some of the salt, oregano, and Lawry spice to the onions while they are cooking. 4. 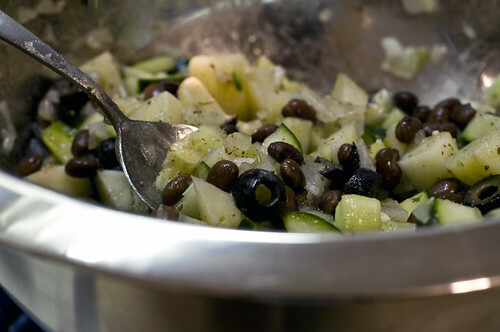 In a large mixing bowl, combine the cooked potatoes, the beans, the zucchini, the olives, and the sauteed onions. Season with salt, oregano, and Lawry spice to taste and mix well. You can really use any of your favorite spices to season it to your preference. 5. 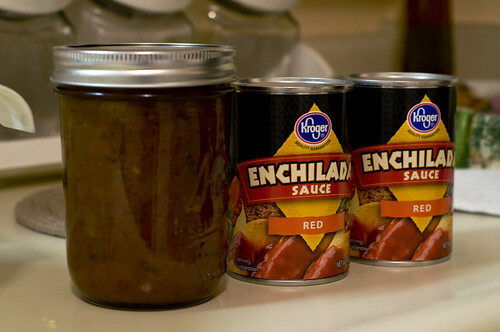 Next, combine enchilada sauce and spaghetti sauce in a bowl and mix well. I used red enchilada sauce, but you can also use green. I used homemade pasta sauce we canned this summer, but I recommend something cheesy if you’re buying from the store. 6. 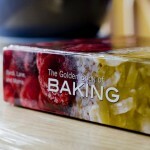 Grease or use a non-stick spray to lightly coat a large oven-proof baking dish. 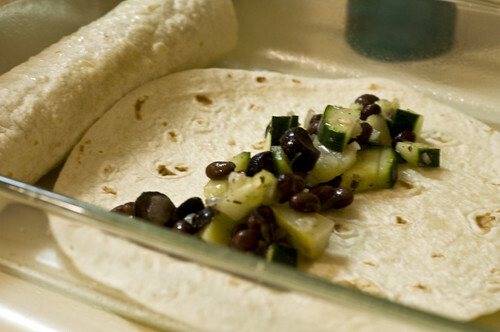 One at a time spread a spoonful of the sauce on a corn tortilla and fill with 1/4 cup of the vegetable bean mixture. Roll each and place seam side down in baking dish. 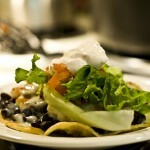 If you’re feeling froggy you can alternatively dip each tortilla in the sauce before filling and rolling. 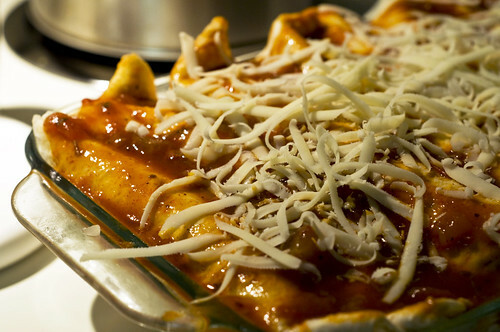 Fill baking dish with enchiladas and coat in as much leftover sauce as you like. 7. Bake in oven at 350 degrees for 20-25 minutes uncovered. If you want a softer enchilada, cover with foil and bake for 45-50 minutes. 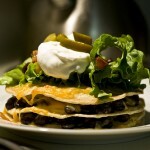 Garnish with lettuce tomatoes, avocados, or non-dairy sour cream and enjoy! 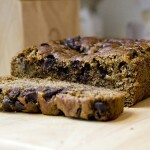 Note: Base recipe is vegan, however my hubby wouldn’t have eaten it without cheese lol. In the future, I hope to try Veggie Cheese alternative options. 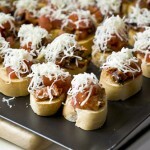 It’s 10:00 a.m. and I’m already craving these. I made a double batch, and I have a huge amount of leftovers (it somehow always happens with enchiladas) so I’ll have several days worth of yummy enchiladas to enjoy without guilt. I think that’s the ONLY thing that is holding me back from going fully vegan. I so rarely eat meat now I just need to draw a line and go back to vegetarianism. 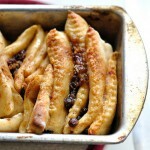 these look tasty! i’m not vegan but i would def make these! I think as you can see from my cheese fumble that it can easily be just vegetarian and still (if not more imo) yummy! I couldn’t give up dairy products…or meat. My diet just feels lacking if I try.